Avoid red wine mouth without avoiding glasses of red wine. 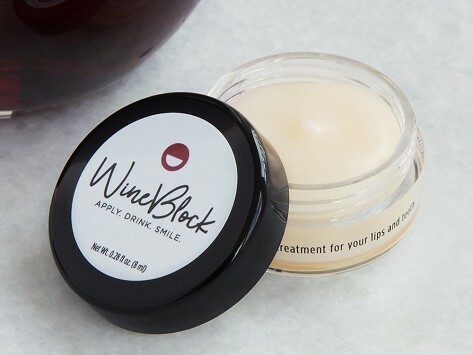 Apply this all natural balm to teeth and lips before each glass, and drink up. A blend of ingredients like coconut oil and rosemary leaf extract moisturize your smile, while tannin- and acid-blocking agents prevent stains from developing on teeth and lips. There's a subtle orange blossom flavor, but it won't interfere with how your wine tastes. Discreet, portable, and Made in the USA. Co-Founders Brenda Kirkpatrick and Lauren Calabrese bonded over mutual red wine mouth-related embarrassing moments. It took two years for the duo to land on a non-toxic, all natural, and effective solution—and we say cheers to the final, stain-blocking result.